with some beautiful old things. They were in need of some love and attention. and re-imagined them into something new. and a set of beautiful chocolate brown velvet leaves. This is how they looked when they entered my life. I am guessing circa 1970? but now, what to do with all those beaded leaves and centers? Hello dear Kimberly...hope you are good! Your transformation looks really gorgeous and I love mini books in the back, too! I like your re-imagining! These make me stop and study with pleasure. They are beautiful! What a wonderful way to upcycle. You definetely have improved those beaded flowers, at least in my opinion as I lovelovelove those creamy colours and the combination of pearls and lace! Beautiful, dear Kim! Dear Kimberly, I can`t wait to see,- they look so beautiful now with the brown leaves, and the rhinestone button- something totally different and so much more gorgeous than their before life. So pretty! 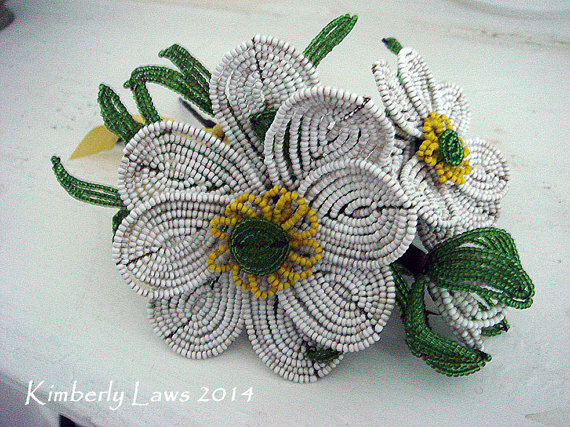 I love these beaded flowers! And your vintage picture books are sweet too! They look so much richer remade. Isn't it fun to do that and have them turn out so nice?